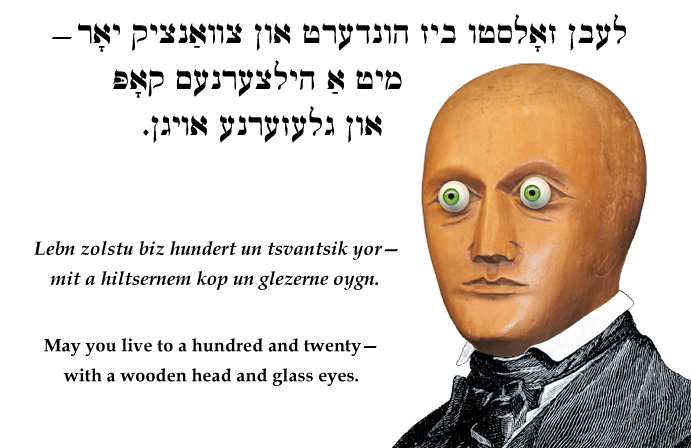 Yiddish Curse: May you live to a hundred and twenty—with a wooden head and glass eyes. לעבן זאָלסטו ביז הונדערט און צוואַנציק יאָר—מיט אַ הילצערנעם קאָפּ און גלעזערנעם אויגן. Lebn zolstu biz hundert un tsvantsik yor—mit a hiltsernem kop un glezerne oygn. May you live to a hundred and twenty—with a wooden head and glass eyes. Lebn zolstu biz hundert un tsvantsik yor—on a kop. May you live to a hundred and twenty—without a head.